Rampage was inspired by the monster film King Kong, the kaiju film Godzilla, and the platform game Donkey Kong. In turn, Rampage inspired a 2018 film adaptation of the same name. Up to three simultaneous players control gigantic monsters who were formerly human. The game's protagonists are George, a King Kong-like gigantic gorilla transformed by an experimental vitamin, Lizzie, a Godzilla-like dinosaur/lizard transformed by a radioactive lake, and Ralph, a giant wolf, transformed by a food additive. As monsters, they need to raze all buildings in a high-rise city to advance to the next level, eating people and destroying helicopters, tanks, taxis, police cars, boats, and trolleys along the way. The monsters can climb any of the buildings, punching them to pieces on the way down which will eventually reduce them to rubble. The various people can also be punched or grabbed and food items can be eaten. The player's monster receives damage from enemy bullets, sticks of dynamite, shells, punches from other monsters, and falls. Damage is recovered by eating the various food items such as fruit, roast chicken, or even the soldiers. If a monster takes too much damage, it reverts into a naked human and starts walking off the screen sideways, covering its modesty with its hands (and in this state, can be eaten by another monster). If the player continues, the human mutates back into the monster or (if the human walked off the screen) flies in on a blimp (but has lost their score), with a full life bar. Smashing open windows generally reveals an item or person of interest, which may be helpful or harmful. Helpful items include food or money, while dangerous ones include bombs, electrical appliances, and cigarettes. Some items can be both; for example, a toaster is dangerous until the toast pops up, and a photographer must be eaten quickly before he dazzles the player's monster with his flash, causing it to fall. When a civilian is present waving their hands at a window signaling for help, a player's points rapidly increase when the person is grabbed. Each monster can hold only one type of person: George can hold women, Lizzie can hold middle-aged men, and Ralph can hold businessmen. Rampage is set over the course of 128 days in cities across North America. The game starts in Peoria, Illinois and ends in Plano, Illinois. In Plano, players receive a "mega vitamin bonus" which heals all the monsters and provides a large point bonus. After this, the cycle of cities repeats five times. After 768 days, the game resets back to Day 1. As game developer Brian F Colin stated "the hardware couldn't support that much art and we never figured anyone would get through 768 levels". Some of the home port versions of the game start in San Jose, California and end in Los Angeles, California after going all around North America. The rampage travels through two Canadian provinces and forty-three United States states. Only Connecticut, Delaware, Mississippi, New Hampshire, Rhode Island, South Carolina, and Vermont are spared. The game's lead designers were artist Brian Colin and programmer Jeff Nauman. Neither of them being fans of arcade games at the time, Colin conceived Rampage as a game in which there was "no wrong way to play." To this end, he wanted to eschew the common video game concepts of having a set objective, competing for a high score and dying. Artist Sharon Perry, game tester Jim Belt and composer Michael Bartlow assisted with developing the game. The game's aim of destroying skyscrapers was created because the developers could only move rectangular shapes in the background. The developers had to work within the technical limitations of the time - cities are largely identical in appearance, Ralph and George are the same character palette and head swapped and the dust effect from crumbling buildings conceals glitchy animation. The game's development and release languished as management was unconvinced of the game's unusual concept of casting players as city-destroying monsters, but picked up after new management was installed at the company. Post-release, additional levels were added to the game to make it more difficult. In the opening cutscene reporting on three humans who had mutated into the monsters, Colin put pictures of himself as George, his wife Rae as Lizzy, and Nauman as Ralph. The game was released for the arcades in 1986. Colin promoted the game via a press release sent to local media outlets in each of the towns mentioned in-game; the press release took the form of an unofficial memo from Bally/Midway that stated that their town was "slated for destruction." Rampage was ported to the Apple II, Atari 2600, Atari 7800, Atari Lynx, Atari 8-bit, Atari ST, Amiga, Commodore 64, MS-DOS/IBM PC, ZX Spectrum, Amstrad CPC, NES, Sega Master System and Tandy Color Computer 3. The Atari Lynx version adds a special fourth character named Larry, a giant rat. The NES version excludes Ralph, reducing the number of monsters to two. In 1997 Tiger Electronics released a handheld LCD version of the game. In 2017, Basic Fun released a mini arcade port of the NES version of the game with Ralph added. This was #10 of their Arcade Classics line. 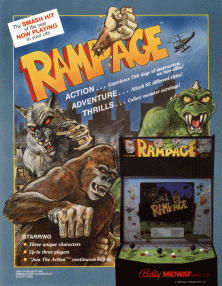 The original arcade version of Rampage was included in various compilations. In 1999 it was included in Arcade Party Pak for the PlayStation. In 2003 it was included in Midway Arcade Treasures, a compilation of arcade games for the Nintendo GameCube, PlayStation 2, and Xbox. In 2005 it was included in Midway Arcade Treasures: Extended Play for the PlayStation Portable. In 2006 it was a bonus feature in Rampage: Total Destruction. In 2012, it was included in the compilation Midway Arcade Origins. The game was also an unlockable in the 2015 game Lego Dimensions. In that game, a human sized version of George the ape appears in one of the sidequests. In the Midway Arcade World level of the game, the player aids him in wrecking the area and protecting him from civilians to get a higher score than Ralph and Lizzie. In July 2000, Midway licensed Rampage, along with other Williams Electronics games, to Shockwave for use in an online applet to demonstrate the power of the shockwave web content platform, entitled Shockwave Arcade Collection. The conversion was created by Digital Eclipse. Rampage was also ported to iOS as part of the Midway arcade app. In 2018, Arcade 1up released a mini 4 foot version of the original arcade cabinet. Unlike the original arcade game, most of the home ports (such as the NES, Sega, and Atari Lynx versions) actually end, rather than repeating levels endlessly. The Amstrad CPC port (published by Activision) has in-game music ripped from the basement level of the arcade game Trojan, despite Trojan not having been ported to the Amstrad. The game was a financial success in arcades, a rare high point for Bally/Midway in the aftermath of the video game crash of 1983. Computer Gaming World approved of the MS-DOS adaptation of Rampage, especially for those with computers faster than the original IBM PC and an EGA video card. It stated that "Rampage is proof that IBM games can compete with other machines in running entertainment software". Your Sinclair said it was "All great fun for a while but being a monster can become a drag. So unless you intend to play it three-handed, when the fun factor increases a little, or you're a monster fan of the original, you might just give this a miss for something with more lasting value." CVG Magazine reviewed the Atari Lynx version of the game in their March 1991 issue, giving it a score of 60 out of 100. Robert A. Jung reviewed the game which was posted to IGN Entertainment in July 1999. In his final verdict he wrote that "A lighthearted, silly game that's lots of fun for lots of players (the more the merrier)." Giving a final score of 9 out of 10. In 2012, Walt Disney Animation Studios named their film character Wreck-It Ralph after Ralph the wolf, since as the bad guy in his game "Fix-It Felix Jr.", his job was to smash an apartment building so the hero Felix could repair the damage. About a decade later, a second arcade game was released entitled Rampage World Tour, developed for Midway by the original designers, Brian Colin and Jeff Nauman. The success of Rampage World Tour as a home console title was followed by console-exclusive games including Rampage 2: Universal Tour, Rampage Through Time, and Rampage Puzzle Attack. The last game in the series made by Midway was Rampage: Total Destruction. The latest version was made by Raw Thrills, a redemption game with designs based on the 2018 Rampage film that was at first exclusive to Dave & Buster's. On November 18, 2011 it was announced that a theatrical film adaptation based on the game was in tentative development by New Line Cinema with John Rickard set to direct. On June 22, 2015 it was announced that actor Dwayne Johnson and producer Beau Flynn were attached to the project. On July 22, 2015 it was announced that San Andreas director Brad Peyton would direct the film. On July 20, 2016, it was reported that production on the film would begin in March 2017. Filming officially began on April 17, 2017. Rampage was released on April 13, 2018 in 3D and IMAX. ^ "Rampage". The International Arcade Museum. Retrieved 5 Oct 2013. ^ Brady, Matt. "Warner Bros. Buys Midway Games". Retrieved July 3, 2009. ^ "Rampage film review - even shallower than the arcade game". Eurogamer. April 20, 2018. ^ "Rampage". Arcadehistory.com. Retrieved 3 July 2010. ^ a b c d Borrelli, Christopher (April 11, 2018). "Before the movie, 'Rampage' the video game offered destruction without death". Chicago Tribune. Tronc, Inc.
^ "Brian F Colin on Twitter". ^ "Arcade Classics: Rampage Review". 10 December 2017. ^ Claiborn, Samuel (13 November 2012). "Midway Arcade Origins Review". IGN. ^ "Arcade 1UP: Rampage". 10 December 2018. ^ "Rampage Music on Amstrad CPC". YouTube. 2010-07-11. Retrieved 2012-09-25. ^ a b Rachael Smith. "Smash everything in sight but don't expect too much of a smash from the thankless task of clearing the inner cities!". Your Sinclair Magazine. Retrieved 9 August 2018 – via archive.org. ^ Julian Boardman (April 1991). "Rampage". Raze Magazine. p. 47. Retrieved 17 August 2018 – via archive.org. ^ Trunzo, James V. (July 1988). "Stompin' On The Savoy / Activision's "Rampage" of Destruction". Computer Gaming World. p. 30. ^ Robert A. Jung (6 July 1999). "A lighthearted, silly game that's lots of fun for lots of players". IGN Entertainment. Retrieved 9 August 2018. ^ "Rampage Returning To Arcades, But Not In the Way You'd Expect". comicbook.com. ^ Kit, Borys (17 November 2011). "Classic Video Game 'Rampage' Headed to Big Screen From New Line (Exclusive)". The Hollywood Reporter. ^ Kit, Borys (23 June 2015). "Dwayne Johnson to Star in Film Adaptation of 'Rampage' Video Game". The Hollywood Reporter. ^ Fleming Jr., Mike. "'San Andreas' Team Reunites For 'Rampage'; Brad Peyton To Direct Dwayne Johnson In Arcade Game Adaptation". Deadline.com. Retrieved August 5, 2015. ^ "Seven Bucks Productions And FlynnPictureCo. Sell Muscle Beach Scripted Project To Universal Cable Productions To Be Developed For USA Network". PRNewsWire.com. July 20, 2016. Retrieved October 1, 2016. ^ Cassidy, Mark. "Brad Peyton Says Rampage Will Be "Emotional, Scary And Real"". Deadline.com. Retrieved November 29, 2016. ^ "Rampage Filming Begins: The Game Adaptation Stars Dwayne Johnson". Comingsoon.net. Retrieved April 17, 2017. ^ D'Alessandro, Anthony (November 10, 2016). "Bradley Cooper-Lady Gaga Movie 'A Star Is Born' Gets 2018 Release Date". Deadline. Retrieved November 11, 2016. This page was last edited on 5 February 2019, at 18:03 (UTC).